DCT Industrial Trust (NYSE:DCT) has not increased its dividends since 2010, religiously distributing the same 28¢ cash dividends each quarter. Such also seems to be the case with the dividends for 2015 as the company has not signaled any increases this year. Clearly, the company is lagging in comparison with its peers, but that does not mean that the company is not advancing at all. Several metrics have improved, and the dividend payout ratio has decreased, so at some point the company will have to pass the gains on to the investors. The business’s fundamentals have grown stronger since 2011. Operating occupancy has gone up consistently from the upper 80s to the mid-90s. Releasing spreads have widened, reaching 14 percent in Q1 2015, and same-store cash net operating income has also been strong through the years. DCT Industrial invests in and develops high-quality bulk distribution facilities designed especially for meeting the growing warehousing needs of local, regional and national companies. The company has been taking advantage of a heated market to recycle its portfolio quietly and redeploy its capital into acquisition and development. 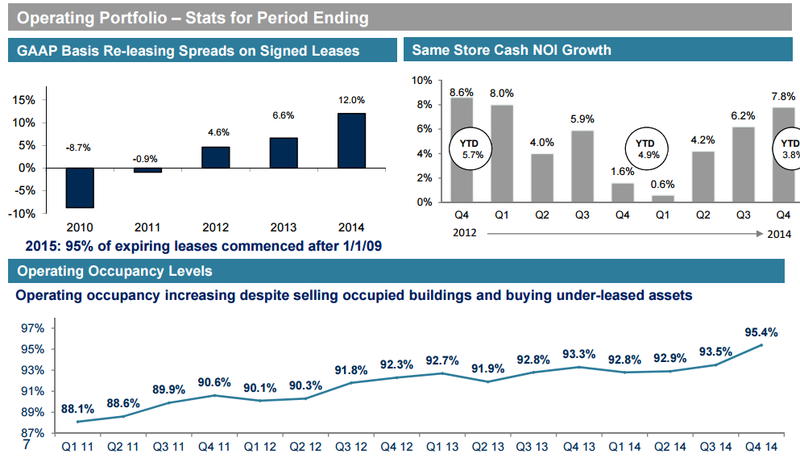 Acquisitions and dispositions activities have intensified over the past quarters. DCT Industrial has left ten non-core markets (Columbus, Kansas City, Minneapolis, San Antonio, Salt Lake City, and Mexico) and repositioned its portfolio towards coastal markets, which now represent half the company. Southern California and Chicago, which were not among the top five markets in 2009, have become so and encompass a quarter of the annual base rent. Legacy markets have decreased dramatically, and a conservative, investment-grade-rated debt profile has helped DCT to raise capital and expand. Valuation metrics have not changed much since last year. Price-to-FFO has been around seventeen, and dividend yields have remained at 3.2 percent. At a time when most REITs have been overvalued, DCT has not been given the same attention, nor does such seem likely this year. Worth watching its transformation, but not a definitive buy.